Can you name the class of lever in these examples? or from ‘side to side’. Look around at the links, levers, cams, pulleys and gears that are used in everyday situations and try to think of new ideas for mechanical toys. 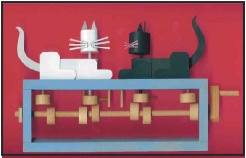 Look at the web-sites that show ‘automata’ and analyse why these toys work as they do. Start by looking at the three ‘orders’ of levers. The first class ~ Number 1 is a simple see-saw or scissors. Notice how the effort needed to move the load is reversed in the direction it acts on the load. Look at the other two classes and see if the same happens with those. Class 2 is seen in the example of the wheelbarrow and the class 3 lever is seen in things such as tweezers and fishing rods. This last class is an inefficient system as the load is further from the fulcrum than the effort. axle, or from a more complex pear shaped cam (See the ‘cats’ model above). 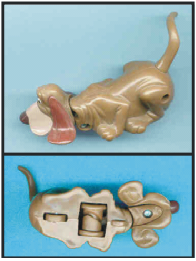 Still more complex movements can be produced from a wavy line cut into a cylinder (see the dog’s head shown above) or from a specially shaped cam. The most important feature of understanding gears in KS3 and KS4 projects is to be able to predict how fast an output gear wheel is going to be turning from a particular input gear speed. it to take longer to turn round - and if it had fewer teeth ... ?